Off the Wall Pots are small plant pots that attach to the wall with invisible fixings making them look as though they are floating. Designed by Thelermont Hupton, these planters can be used to create a wall garden and are also ideal if you don’t have much floor or table space for plants. With their invisible fixings, the little pots let your plants nestle on the wall as you create vertical indoor gardens around your home. 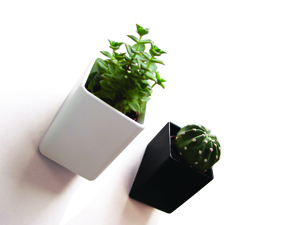 Perfect for use in the kitchen as herb planters; or create a geometric pattern on a wall to add interest to a room. Manufactured in powder coated steel. Chop 2 Pot Cutting Board is an award winning chopping board design that will make sure your carefully chopped ingredients always make it into the pot. Designed by Mark Sanders and Joseph Joseph, this innovative chopping board incorporates the latest technology in polypropylene ‘living hinges’. 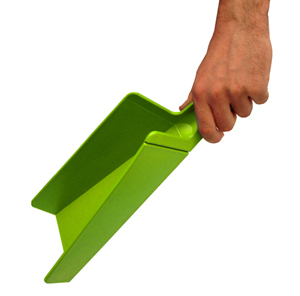 Chop 2 Pot is available in green and black. Magnetic Measuring Spoons are a kitchen essential. These double sided spoons designed by Joseph Joseph feature a teaspoon at one end and tablespoon at the other, with a half line measure on each to ensure quantity accuracy. 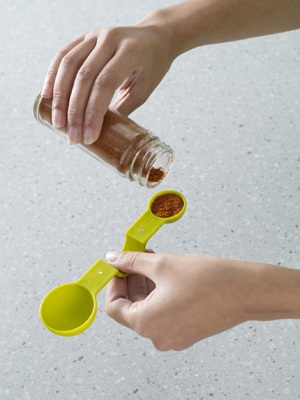 Two magnets in the handle give these spoons a dual purpose. They can be attached to the fridge or other magnetic surface and used as memo holders. And they’ll always be close at hand when you need them. Magnetic Measuring Spoons are available in green, red or grey. 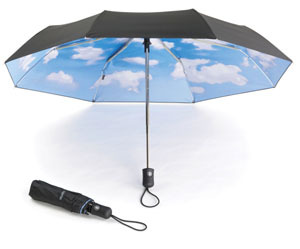 The Sky Umbrella designed by Tibor Kalman is sure to make you smile each time you use it. From the outside, it looks just like any other plain black folding umbrella, but open it up and it’s interior reveals a photo of a bright blue sky. As you look up at a brilliant blue sky, it will brighten up even the most miserable and rainy day. Whilst everyone else walking under a cloud of dull grey will be wondering why you look so happy …? The Sky Umbrella has an easy one button open and close mechanism on its handle and comes with an elastic wrist strap and black nylon sleeve with blue border. Magnetic Photo Frames are a great way to display your favourite photos. Using these photo frames you can your transform your fridge into a photo gallery. But so you don’t forget those important reminders, the set comes with an extra magnet to hold essential notes. 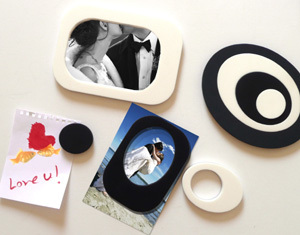 Magnetic Photo Frames are available in black and white or green and brown. They come as a set of three frames plus extra magnet.